I don’t know if this is the case in most places, but in the town where I grew up, when you graduated from high school, you had a big open house and invited all your high school friends, teachers, and neighbors. Scheduling was, of course, a nightmare, since come June you suddenly had over a hundred kids all trying to schedule parties within the span of a couple weeks while trying to keep from overlapping too much with anyone else. During those few weeks there was absolutely no need for parents to attempt to cook because we all wound up hopping from party to party, filling up our bellies from the deli platters, crudites trays, and tiered stands bedecked with bars of all flavors – lemon bars, blondies, 7-layer bars… All in all it was a 3-week showcase of quality Midwestern fare (and truly, I say that with a great deal of fondness). At that age I had developed the standard teenage angsty sense of needing to show how special I was. And since full out coolness wasn’t in the cards, I instead cultivated an interest in high culture, which, while sophomoric and stilted, also turned out to be sincere. I preened and announced my affection for opera and T.S. Eliot. I sketched and wrote pretentious essays about my thoughts. And I liked fine foods (while also being perfectly happy to stuff my face with Oatmeal Cream Pies or Chewy Chips Ahoy topped with Cool Whip. Ah, the teen years. I’m afraid the cream pies and chips ahoy are the only things I’ve fully outgrown.). So, for my graduation open house, I asked my mother to have it catered with Indian food, which had only just become available in our area. And, I’m pretty sure I mostly did this because my boyfriend at the time loved Indian food. My party dovetailed with that of next door neighbor, who was (and is) also one of my best friends. We had decided that my house would be the savory food stop, and then she had a dessert buffet. I’m pretty sure I left my party early to go to hers and hover with our friends over the chocolate cakes. I recently rediscovered a stash of cards that I had received at my graduation open house. Rifling through them, reminiscing, I found one in particular that turned out to be a treasure. It was from a guy friend of mine who was a couple of years older and who was back home from college when he came to my party. He had gotten me a card that he said he thought I would really like because it had a recipe on the front, a recipe for a traditional yogurt cake. Looking at it now, I’m struck by how remarkably thoughtful that is for a boy of that age, and it makes me feel grateful all over again for the wonderful friends I’ve had through the years. I also realized it was time to make a yogurt cake. 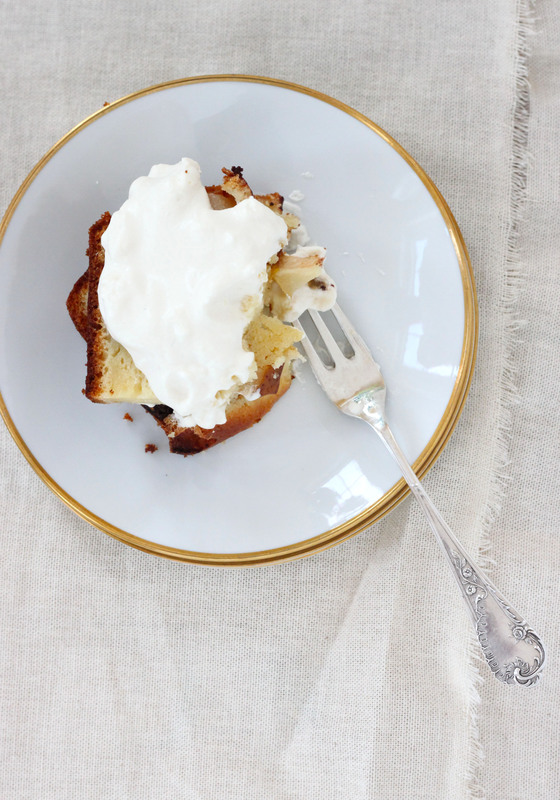 Yogurt cake is a wonderfully simple, traditional French afternoon snack cake. It’s part of the reason why I love the French. IT is similar to a pound cake, but the heaviness of the butter is traded for the freshness and mild tang of yogurt. A bit of oil stirred in at the end gives the cake a golden slightly crackly top crust without weighing down the tender crumb. The most traditional version is flavored with just some lemon or other citrus, but a yogurt cake is really a canvas to which you can add all sorts of berries, fruits, or other goodies. Thinking of another classic French dessert, poires belle Helene (which I grew up calling paere bel Helene, and thinking it was a Norwegian dessert), I filled my cake with bites of soft juicy pear, and bittersweet dark chocolate. The result was a wonderful dance of flavors, subtle but certainly not shy. A warm slice of the cake makes a decadent treat on its own. But add a dollop of softly whipped vanilla-scented whipped cream and you’ll find yourself with an ethereal dessert that demands being savored with your eyes closed. That card has been moved from its shoebox and taken up permanent residence in my little book of recipe notes. Preheat your oven to 350F and grease an 8 inch loaf pan with butter. In a small bowl combine all the dry ingredients (flour through salt). In medium bowl, whisk together the sugar, yogurt, eggs and vanilla until smooth. Then, stir in the dry ingredients, a bit at a time, until well blended. Finally, use a rubber scraper to fold the oil into the batter until it is fully incorporated. Wow, that is a beautiful piece of cake. 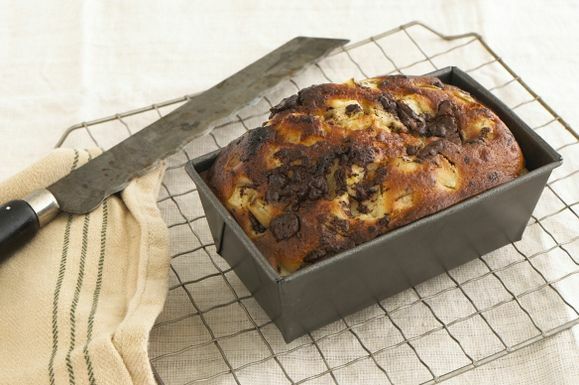 The pear and chocolate combo sounds so sweet and delicious. I have a linky party going on at my blog called “Sweets for a Saturday” and I’d like to invite you to stop by and link this up. The lemon versions are definitely delicious, but I do hope you give some other fun flavors a try! 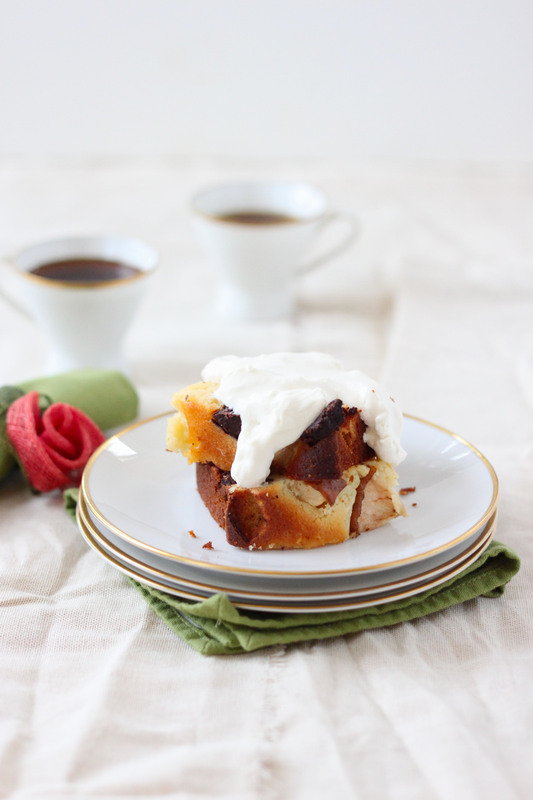 Yogurt cake lends itself so easily to variation. What a delightful recipe…I can’t wait to try it. It manages to combine sophistication with comfort food. Well done! Beautifully written piece with wonderful photos–a pleasure just to read! I will most definitely try this cake/bread–glad I need to stop for groceries today! I made this yesterday and both my older daughter and I LOVE it!! I think I will tweak it just a bit and dust the pear pieces in flour and fold into the whole batter but overall–delicious–thanks for sharing!! BTW– I added the yogurt to the sugar mix–worked out great. 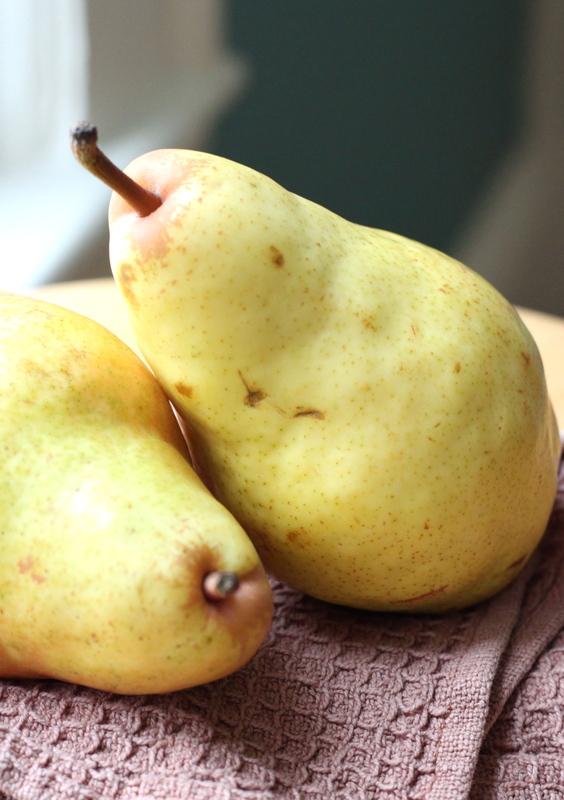 Tossing the pears with a little flour and stirring them through the whole batter would definitely work. I just have a weird thing for putting layers of goodies in my cakes rather than distributing them evenly! i didnt see where you add the yogurt? So I put it in after the oil? Yes. You put it in with the rest of the wet ingredients (except the oil). Sorry for the confusion. Hi Andree, You can certainly share my recipe on your blog. All you need to do is give credit to where it came from and link back to this post! I’m so glad to hear that you are getting into cooking, keep up the good work! Thank you! I certainly will link! I’ll be in touch when it’s done. I hope you have a terrific weekend! Here ’tis! I hope you approve! Thank you for this recipe. I will try it this weekend. Amazing! I made this today and am afraid I’ll eat the whole loaf myself. I added some grated ginger. Wonderful! The addition of grated ginger sounds yummy! Oh good! I’m very happy to hear you liked it so much. What a beautiful tradition your home town has for graduation. Does it endure, I wonder? And what a wonderful keepsake from a good friend this recipe is. Anyway, this cake sounds divine and I wish I had a pear because i want to make it NOW! Thanks. Thanks! I think the tradition does still endure, actually. Which is lovely, I think. And, I hope you get a chance to make this cake sometime! Yum, thank you and thank you to your high school friend! I love your writing and you pics. I decide on a recipe by the looks of the texture of the food and your cake seems more than perfect. Do you mind sending me exact recipes in grams please or else tell me which conversions to use from cup to grams. Thanks a lot in advance. forward to trying this 1. I love the picture, it lured me into making this cake. I make it at least once a year. It’s something different and I love it! Thank you for the recipe and I enjoyed your story with it! 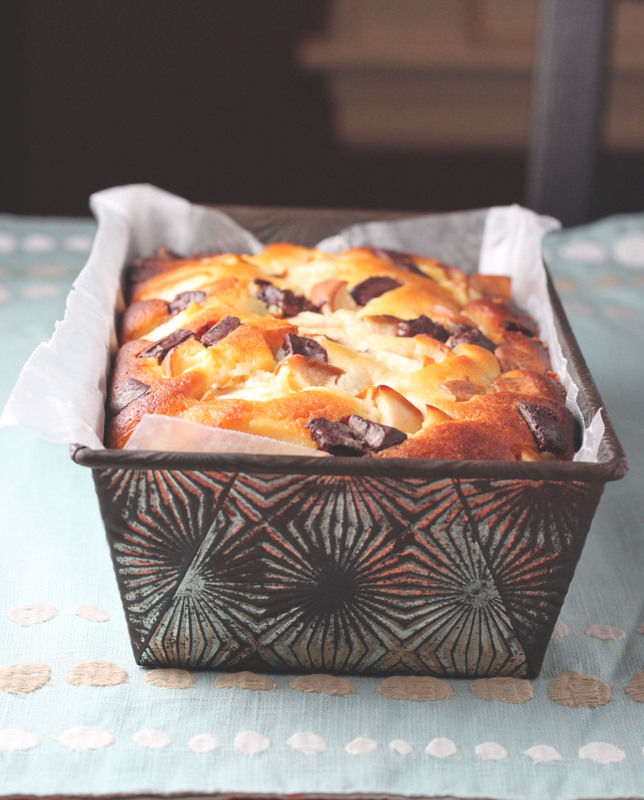 You are currently reading Yogurt cake with pear and dark chocolate at Five And Spice.